Rare Chinese Government collection of 45 highly detailed topographical maps of Beijing or Peking, China. This is an extraordinarily rare set of 45 post-Liberation topographical maps Beijing or Peking, China. They were issued in 1954 by the People's Republic of China and are de-accessioned library pieces. 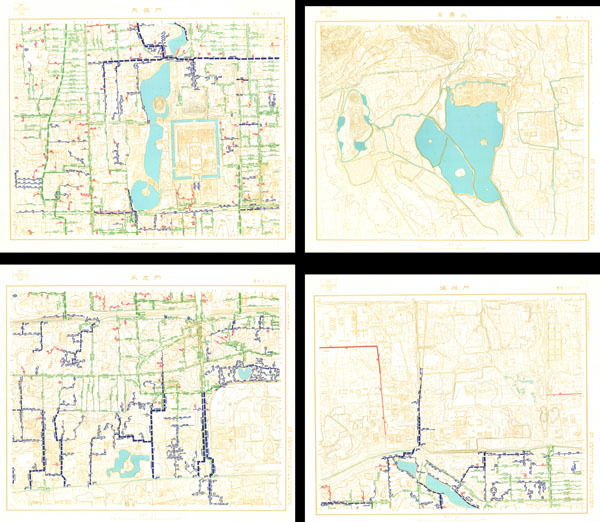 Each map focuses on a different portion of the city and, as a whole, forms one of the most highly detailed mappings of Beijing and the surrounding areas available. Covers such important sites as Tiananmen, the Summer Palace, the Forbidden City, and countless other locales. All text in Chinese. Each of the 45 Maps measures 54 x 64 cm. This is a once in a lifetime opportunity to own this exceedingly rare map set. Very good. Some maps exhibit edge wear or minor flaws, but generally this set is very clean.